It would be nice if it were true. But it is, in fact, doubly false. First, tariffs are not “being charged to China.” They are being charged to American firms importing Chinese goods. 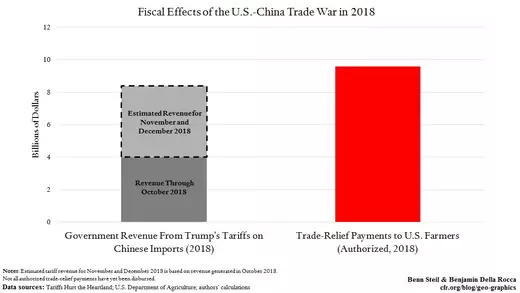 As the left-hand bar in the graphic above shows, such firms will pay about $8.4 billion in tariffs on China imports by the end of 2018. Second, this tariff revenue does not remain in U.S. government “coffers.” As shown in the right-hand bar above, all of it and more is being paid out to American farmers as partial compensation for their losses from Chinese tariff retaliation. The U.S. government has already committed to paying out $1.2 billion more to angry American farmers than it will take in this year from angry American firms. By launching a trade war with China, therefore, the president has simultaneously raised taxes on U.S. companies and lost the government money. And with the farm constituency critical to his 2020 re-election hopes, the losses are only set to mount going forward.